Sunnyside Dru: what thrills you? Does a grain bin thrill you? It does us! So far we have taken delivery of our GMO free feed in woven plastic bags. Over the course of a year, we estimate the number of bags to be well over 500. Each bag is hefted from the delivery truck, loaded into the feed room, and then hefted and loaded into our truck and then hefted one more time before being loaded into a garbage can near the poultry pens. Then, it is scooped into buckets and served to the poultry. That's a lot of hefts. The bags are *supposed to be 50 pound bags. Our feed supplier really loves...actually, prefers not...to fill these bags, so they are usually closer to 80 pounds. Cuts down on the number of bags needed each trip, but hundreds and hundreds of bags at about 80 pounds gets...old. The worse job on the farm is cleaning the brooder in July. But the movement of feed from where our supplier delivers to where the poultry is located that particular day never stops, year round. So. Craigslist. 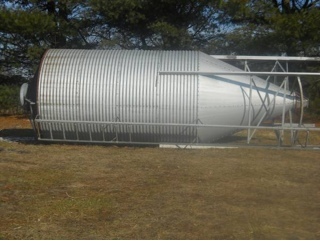 Offering of a multi-ton grain bin. Every year we peruse the Farmer Boy Ag Products catalog and dream of a grain bin. Then something else needs done and we go back to hauling bags. And, worse, filling the landfill with them. While carrying reusable bags to the store. Ack. This weekend, this becomes ours. A cement pad under will allow us to back in, fill our buckets directly, and then move them right to the pens. When the supplier arrives the feed can be blown in, with no bags used anywhere by any of us. Our Food Alliance Certification asked us to continually improve our environmental efforts. This one we feel goes a long, long way in that effort. And to saving our backs. And reducing the amount of feed spilled while loading and unloading. Now we just need to figure out how to stand this thing up. Block and tackle my husband tells me. Gulp I say. We are truly thrilled at how life changing this giant can will be.